Tanzila Khan was born in Sialkot, with a physical disability, which meant that she couldn’t walk and was confined to a wheelchair since childhood. She is a story of struggles and accomplishments that has redefined her identity and has given her life, a new perspective. Though her mobility is limited, she has made sure that’s the only limitation in her life. One is intrigued, and with a little exploration, one of the major forces behind her drive, and positivity is uncovered. At 16, she launched her first novelette, 'A story of Mexico' and then sold her novel to aid the earthquake victims of Pakistan. Her second novel is 'The Perfect Situation'. She also works for education, entrepreneurship and rights for disabled citizens. She has worked with British Council, Global Change-makers, Oxfam, and Y-peer as a trainer and resource person for youth. She inaugurated her production company, 'Creative Alley', which is purely an effort to cater to those individuals who face problems in making their creations accessible to the world. Her signature workshop is, let’s get M.A.D (Make a Difference), a youth capacity building workshop. She currently speaks on many international forums about peace and harmony. Be it completion of a manuscript or a social charity drive, everything holds a significant place in her life. Keeping her restricted mobility to a side, she has achieved much for any individual of her age and desires to go on. Other than painting and writing books, she likes to work for education and disability rights in Pakistan. Her projects include ‘I wish Knowledge’ affiliated with Global Change-makers (British Council) and The Ramp Movement. She has to help provide a platform to those who hold interests just like hers. 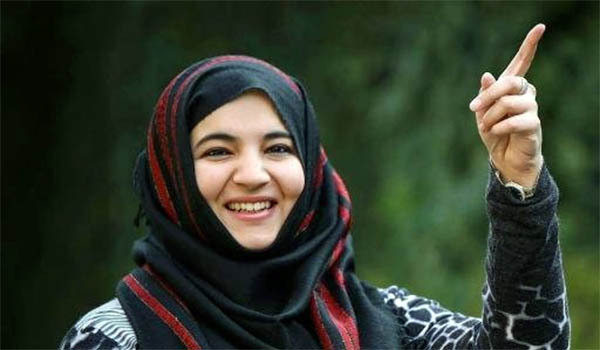 After representing Pakistan on National and International Forums, she turns her direction right into the training industry introducing herself as a fresh young trainer affiliated with School of Leadership and the journey continues. Most of us use the brick-walls and the hurdles we face in life as an excuse to eschew striving for our goals and realizing our dreams. However, Tanzila Khan’s life and her ambitions serve as an example of what one can achieve with willpower, drive, and a positive mind set, despite all obstacles. Her motivation definitely comes from the fact that she is alive and she made it to this amazing planet, Earth, with so much to do and so much to contribute to. Along with that she is also inspired by how her parents coped with her birth despite it being very sudden for them. They live the example of giving back the best no matter what life gives you. You sit across Tanzila, and you tend to forget after a bit that she’s on a wheelchair, but what cannot escape anyone’s notice is how active she is, and the number of projects she has started and is involved in, whether it be Youth Activism, motivational speaking, theatre, or writing her very own novel. You then wonder what might have sown the first seeds, and how it then developed into all it is today. She sits there talking animatedly about all that she’s involved in, and her passion is truly reflected. But then, you wonder, a female, a youngster and physically incapacitated in a society like Pakistan. The challenge must be daunting indeed. Yet she takes it all in stride, saying that though the physically challenged are discriminated against in the country, it’s just because it’s the norm, and there is need to change perspectives in this regard. As for gender being a stereotype, she feels that can actually be an advantage. Being a female she is more emotionally connected to the people she work with and can easily help them in their pain through this connection and being a female earns her more respect and honour from the fellow men in Pakistan. Tanzila believes she has a huge responsibility. She really believes in the impact that a youngster in Pakistan can create. So it does make her question herself all the time, whether what she is doing is right and making the best of what she has. She would be really ashamed if she is not able to play her part and contribute towards her country. One is left truly impressed with this girl whose passion and drive knows no bounds, and who is in every way extraordinary. One realizes that the extraordinary originates from the simple, the common, the ordinary from people and youngsters like you and me, but those with a dream, and a passion to fulfil those dreams.